A Thule hitch cargo carrier is the ideal solution for transporting extra gear on the rear of your car. And you can still use your car trunk! 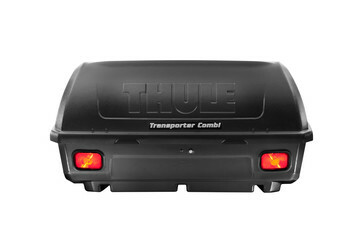 When you want to bring everything you need, Thule hitch cargo carriers give you extra carrying capacity. Safely and securely mounted to your car’s hitch, the storage box cleverly tilts down so you can still open the trunk and make use of the space inside. What’s more, the box has a smart locking system to ensure that the lid is closed and secure along with your gear. With a safe, secure, tough and yet stylish design, your hitch cargo carrier will look at home on your car and on your travels. It’ll also become a valued travelling companion as the extra carrying capacity opens up new adventures. Your favorite activity may need a lot of bulky equipment. Or you may want to share your passion with family and friends. No problem! Just load up and hit the road. You can rest assured that a Thule hitch cargo carrier has been designed to face every challenge on the road and still keep pace with your life. We’re confident because the design has been tested to the limits and beyond at our Thule Test Center™ where our products must survive a punishing battery of extreme tests. It’s also been designed to keep your gear safe and secure at all times with a smart locking system that makes sure the lid is closed and locked before you drive off or leave your car unattended.